Yesterday was a banner day for French helicopter manufacturer Guimbal as it marked its entry to the U.S. helicopter market, with the delivery of its first Cabri G2 light single to Newberg, Ore.-based operator and training provider Precision Helicopters. While the EASA approved (2008) two-seat rotorcraft is now in operation in 22 countries, at the delivery presentation, company president and CEO Bruno Guimbal said entering the American market has long been a goal. 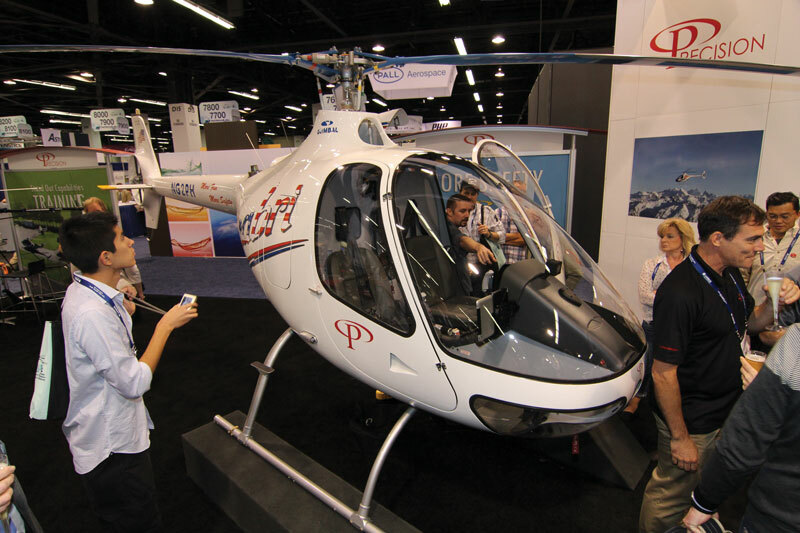 “We would never be a real manufacturer until we supplied helicopters to the [U.S.], and it’s coming now,” he told the crowd gathered around the Precision booth (No. 7311) to see the first Cabri G2 in the country. The helicopter, which is powered by the same Lycoming engine as the Robinson R22, has not yet earned FAA approval. Certification is anticipated in the next few months, leaving Precision to ship it back to Oregon after the show. Guimbal told AIN that his company has delivered 64 approximately $400,000 G2s to 32 operators worldwide and currently has a backlog of more than 100 rotorcraft. As the orders increase, he is striving to reduce order lead time to less than a year. Precision expects delivery of another G2 in June, with more to follow next year. The company is positioning itself as Guimbal’s West Coast distributor and authorized service center. Here at the show, Guimbal notched its second U.S. customer, Heritage Helicopter Services, which expects its first delivery in March 2015. According to chief pilot Curtis Spears, the Beaumont, Texas-based company will order up to six G2s, eventually changing over its fleet entirely to the French helicopter.